Love, Mrs. Mommy: Baby Gates Are An Important Part Of Baby Proofing Your Home! 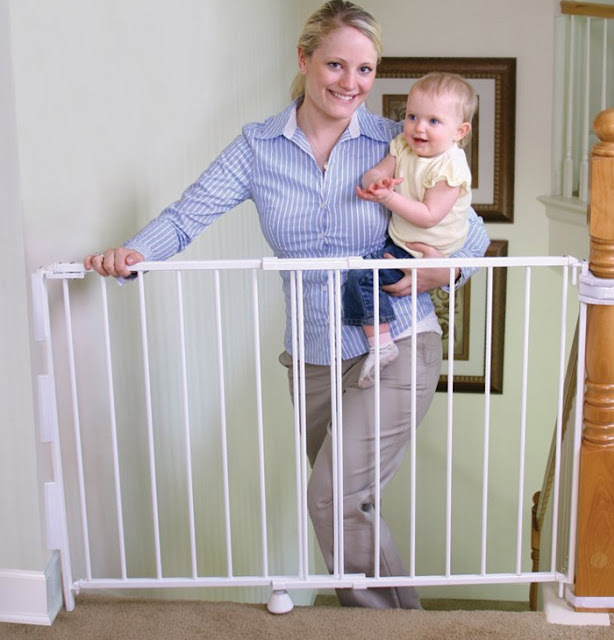 Baby Gates Are An Important Part Of Baby Proofing Your Home! Do you have a little one who is just learning how to crawl, or is already on the move? The transition from baby to toddler seems to happen way too fast and there is a lot that needs to be done around the house to baby-proof it. One thing my husband and I found to be paramount for our house is a baby gate. We have these (what I call) horrifying stairs that lead right to our basement from our living area. It would certainly be a long fall for an adult and just the sheer thought about my little peanut falling down them sends shivers down my spine. That’s why I want to talk about baby gates and I am happy to partner with Diapers.com to tell you about their products and offer you these safety tips. 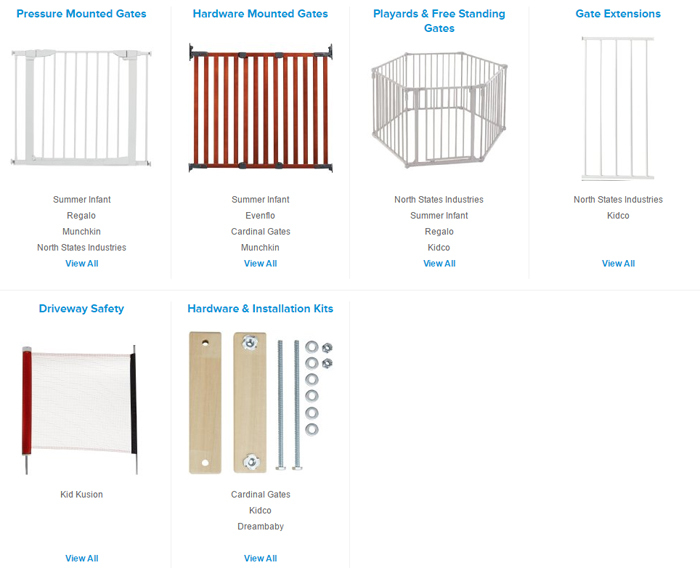 Diapers.com carries the best baby gates around. Everything from pressure and hardware mounted gates to free standing gates and playards. They also have gate extensions for larger doorways along with hardware and installation kits. Don’t forget about driveway safety… they have you covered there too! According to the CDC, “falls are the leading cause of non-fatal injuries for all children ages 0 to 19. Every day, approximately 8,000 children are treated in U.S. emergency rooms for fall-related injuries. This adds up to almost 2.8 million children each year.” One simple way to bring down those statistics is by using a baby gate on all your staircases. Baby gates are also great for blocking off rooms like a bathroom that has cleaning supplies or other hazardous materials. Storage rooms and other areas where things could fall on your little one would also be a great place to use a baby gate. Pretty much any place you think would be unsafe or should be off-limits for a new little explorer, would be a wonderful idea. Keeping our little ones safe is a top priority but, unfortunately, we really don’t have eyes on the back of our heads (no matter what our kids think). But, having a baby gate will surely help act like a second pair of eyes. KidsHealth.org gives some wonderful safety tips on keeping your little one(s) safe from harm inside and outside your home. Included information is stair safety. They state that you should “never leave a child unattended around stairs — even those that are gated. Babies can climb up the gate at the top of the steps and fall from an even greater height. Properly install a safety gate at the door of your child's room to prevent the baby from ever even reaching the top of the stairs.” Which I think is a wonderful idea! When you are looking to make a purchase keep in mind this information from Safe Kids Worldwide. Make sure to always use “approved safety gates at the tops and bottoms of stairs and attach them to the wall, if possible. Remember to read the manufacturer's instructions and warning labels to make sure you have the right gate for your needs. Not all gates are safe for use at the top of the stairs.” It is best to evaluate your home to see exactly what kind of gate(s) you need for where they would be installed. Be sure to write this information down so that when it’s shopping time, you will know what you need. Don’t forget, Diapers.com has a wide variety of baby gates, and they are all right at your fingertips! No need to go out to the store and haul one home. Have it delivered, right to your door!